There’s nothing better than hot food when you’re hungry. And there’s nothing to make you hungry quite like exploring the great outdoors. That’s why owning a great portable gas grill is a fantastic idea. You can keep this handy style of compact grill in the back of your car and pop it out when needed – whether that’s on the beach, in the bush while camping or on the back of your friend’s patio. You’ll feel so prepared and super gratified as you bite into the tasty steak, sausage, burger or bacon delight that your grill cooked. 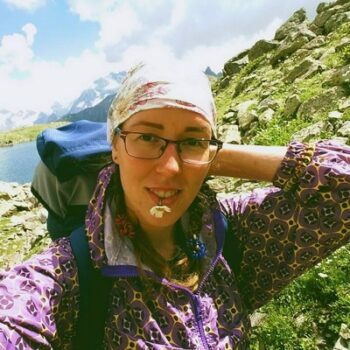 Many people are interested in getting a portable grill, but, find that the range of options on the market is a bit confusing. To help you out in your search for the best portable gas grill for you, we’ve compiled a list of our six favorite ones, complete with full descriptions of what we like about each one. Our portable grills list is presented in order of price to help you find the niche that you’re after. Each grill has its own unique pros and cons and it’s important to think about what you personally want from your grill. Heat strength vs. size vs. monetary value, etc. We’re sure there’ll be something for everyone in the list provided. But before we can get into reviewing our six handpicked products for you, we need to cover a bit of groundwork on key features of portable grills and what they should mean to you. Portable grills contain a variety of different features depending on what strengths the manufacturers want to play to. Often times what you pay for is what you get in this market, meaning that in order to get a premium quality grill with all the mod-cons you may have to pay a little extra. That being said, if you know what to look out for you can definitely snag a bargain here and there. It’s important to briefly analyze the following elements that make up a portable grill and decide which are most important to you. The larger your grill’s cooking surface area the easier it will be to cook. Getting a decent sized grill surface is especially important if you have a large group of people or family to cook for as being able to place multiple items on the grill at once will make the cooking process go much farther. When you’re constantly packing up and moving your grill, it’s important that it be convenient and easily portable. The main factors influencing this will be its weight (aim for lightweight but high quality materials), overall size (this may mean sacrificing a little bit of grill cooking surface area) and it’s setup complexity (we’re looking for a lack thereof). This is well worth considering when you invest in a portable grill as most don’t come cheap. You want to get a portable grill that can go on all your adventures with you and stand the test of time. 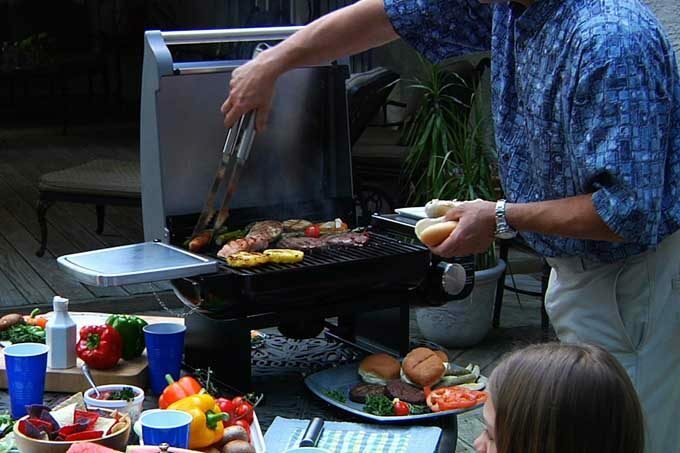 Enamel, steel and hardened porcelain are examples of common strong materials used to make portable grills. More of an individually appreciated choice than anything, we think color should definitely be in your mind as you look at portable grill options. Chances are you’re going to be enjoying this thing for a long time to come, so aim for one that you appreciate aesthetically. There are so many options to choose from that we think you can definitely find something that suits both your functional requirements and eye taste. The BTU rating of portable grills indicates how powerful they are and how quickly they could be capable of cooking food. For those interested, BTU stands for British thermal unit and is the amount of work needed to raise the temperature of one pound of water by one degree Fahrenheit. For a portable grill, you’d be looking for at least 5,000 BTU. That’s a very short summary of the key elements to look out for when you’re investigating portable grills on the market. We think you’ll find that it’s not so hard to identify the grills that are more suited to your needs and those that aren’t. Do take the time before you embark on your search to figure out what you think you will most often be using your portable grill for. For instance, if it’s out with the kids then a non-flaring grill is important, if it’s out camping then a robust frame is important, and if it’s at social events then a stylish exterior design might be important. Think about what you want in a portable grill, and then go find it! We’ve listed some of our favorite options below in order of their price. Don’t jump straight to your price range, though, you may find what you’re looking for costs less (or only a teensy bit more) than what your budget is. So without further ado, here are our top portable gas grill picks. 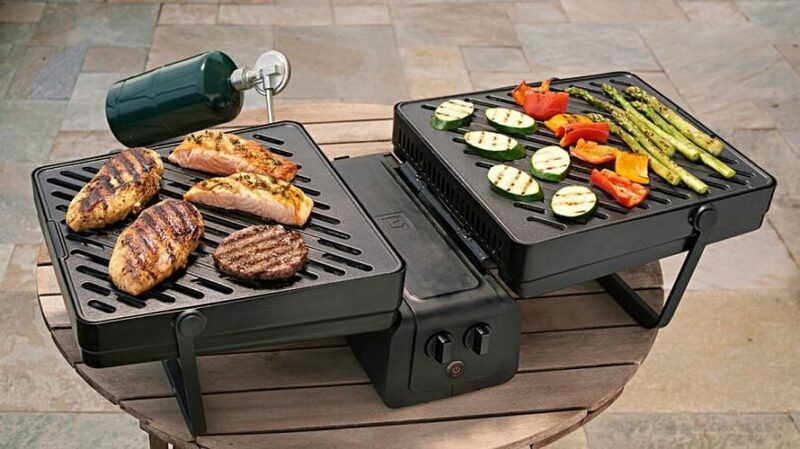 Now that you know which features are most important when choosing a portable gass grill, here are a few of the best models on the current market. Description: The Weber Go-Anywhere Gas Grill is the cheapest item on our list. We’d be tempted to say it offers the best value for money as well, but then again that depends on many factors, but let’s just explain what we’ve experienced. It’s lower price range does mean that this grill offers a smaller grill cooking surface area of 160 square inches and a slightly lower power setting of 6500 BTU -but honestly, for a portable grill, that’s plenty of space and power. We think it’s the ideal size to take out to the park for outdoor meals. The porcelain enamel stamped steel cooking grate provides excellent heat distribution and we appreciate its safety feature, which minimizes flare-ups. We think this is one the best small propane grills available. If you’re looking to save on cash and still have a portable machine to cook on, then this could be the grill for you. No frills and no hassle. Related: Every grill in the universe (that we’re aware of) needs an adaptor hose to feed gas into it. This Adaptor Hose from Weber would work perfectly with their Go-Anywhere Gas Grill. Description: The Fuego Element Gas Grill has added another level of convenience on top of the general awesomeness that is portability. And what is it? The quick clean function! Everyone knows that grilling can get messy and greasy with all the oils from your meats coming through the pan. When you’re outdoors at the beach or in the bush, you don’t often have a proper kitchen around, which makes cleaning grills even more difficult. 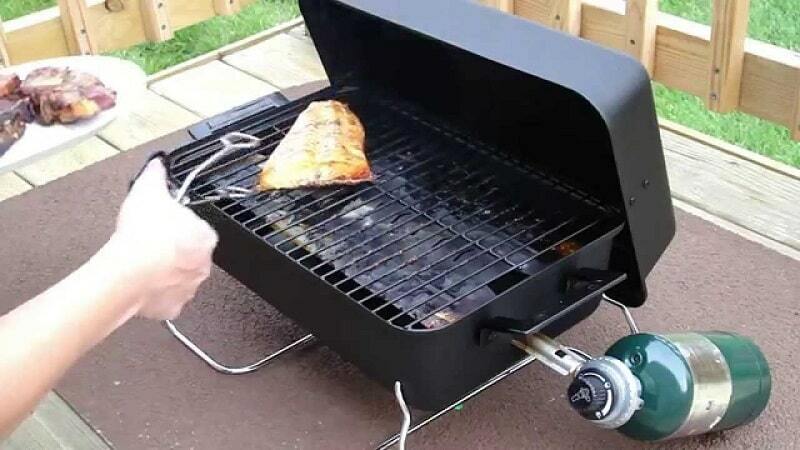 The innovative designers of this grill were smart enough to incorporate a grease management system into it. All you have to do is unscrew and remove a tray for easy clean up. Dip the tray in your soap bucket, give it a scrub and you’re done! 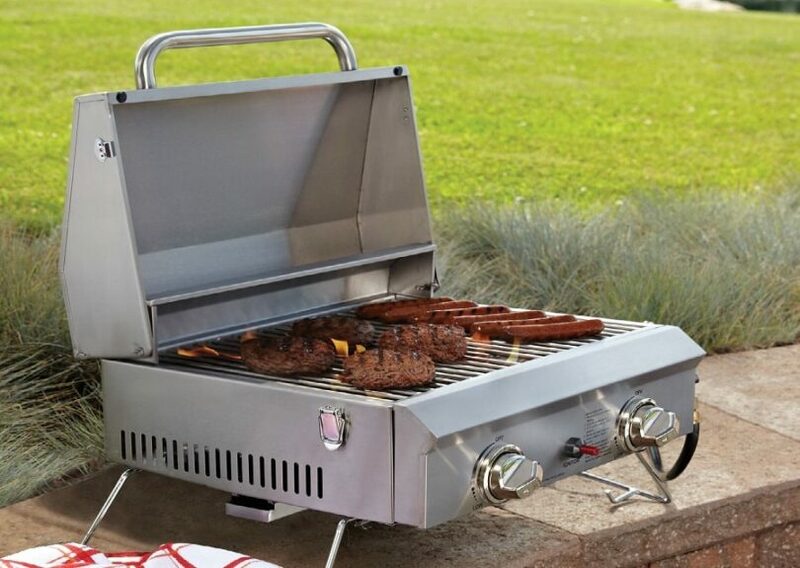 Other quick things to note about this grill is that it comes in a black, silver and red color scheme with short legs, so will be close to the ground when you use it. You might be alright with that or you might want to grab a table to use it on. That’s up to you, but we definitely like the grill. Related: You could also purchase this great Machester Wood Portable Table to place this grill on if you’re keen to cook standing up. Description: We love the stylish Cuisinart Gourmet Gas Grill. Its aesthetically pleasing red, brown and silver design looks like it came straight out of a quaint kitchen. We think it would look great out on a patio during outdoor meals and parties. Not only would it look great, but it would do the job of cooking credibly too with a 145 square inch grill surface area and a 5,500 BTU stainless steel burner. On top of this you have the even-heating porcelain-enamel grate which will help ensure your food is cooked evenly throughout. The idea with this grill, is to both look and play the part of a gourmet chef on your patio. It’s easily portable so you can pack it away when you’re done or take it over to a friend’s house for an evening out. We like the briefcase style carrying handle which fits in well with the overall appearance on classiness. Again, this price range doesn’t allow for a very large cooking surface area or overly powerful BTU rating, but those things really don’t seem necessary for a small portable grill anyway. Related: When you go through the trouble of getting such a good looking grill, chances are you want to keep it looking great. An easy way to do this is by using a grill cover, and this Cuisinart Gas Grill Cover would fit perfectly over this grill. Description: We really like the Char-Broil Infrared Gas Grill’s small and no frills approach. It gets the cooking job done with a TRU-infrared cooking system which means there are no flare-up from the heat. This lack of live flame is an important safety feature is what makes this small grill so great for using with young children. Kids love to help their parents cooking dinner, and with the Char-Broil grill things are just a little bit safer than normal. In addition the temperature gauge on the outside of the cast aluminium firebox top lets you easily judge how well cooked your meat will be. Overall, even though it’s a tad on the smaller side in terms of grills, we think this is a fantastic option for those with kids. 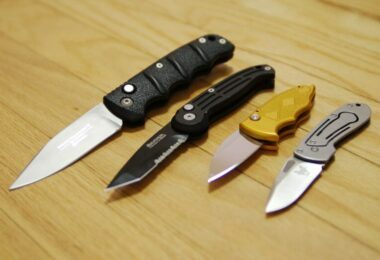 The small side could even be seen as a positive because of how easily portable this thing is, it even has carry handles! Related: A grill needs gas to get cooking, so having some portable gas bottle on hand is just as important as having a grill. These 16.4OZ Prop Bottles look like a good size option to us. Description: The Cuisinart Everyday Gas Grill is a powerful 15,000 BTU grill option with a sturdy stainless steel loop burner and porcelain enamel cast iron grill grate. 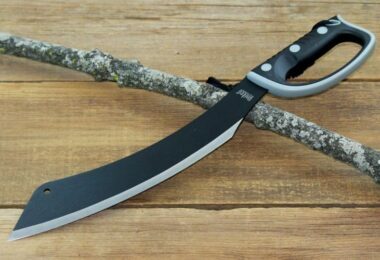 Clearly made from high quality materials that are intended to last, this is a good long term investment for the avid camper. With an easy setup and electronic ignition, you can get your evening meal set up at camp in no time. We especially love the side tables on either side of this grill because it allows room for you to place dishes or food when it’s done. This is useful for campers who don’t have a great number of spare table top surfaces and would like to keep their food out of the dirt. The only downside is that the 240 square inch grate is slightly smaller than a full size grill would be. This is only a problem if you’re planning on cooking a large feast, though, as the space does allow for a decent amount of patties (we’re guessing 10). Related: If you’re thinking of getting this grill you might want to consider the fantastic Cuisinart Grill Cover as a counterpart. It’ll protect your grill from the elements and keep it looking new for years to come. Description: The bright orange design of the O Grill 600 Portable Grill is certainly eye-catching, as is it’s clamshell body. 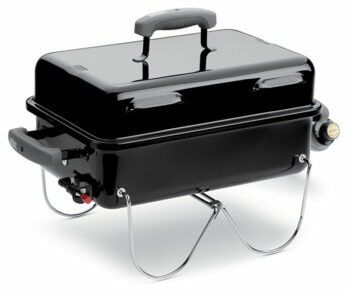 This unique portable grill is one of the most convenient on our list, with retractable legs that take up very little space when it’s stored and a handlebar attached to the hood for easy transportation. If it weren’t for the weight, which is a bit more than the rest, this would be one of the easier grills to carry around. The auto ignition adds to this convenience factor by ensuring that users can get the burner lit quickly every time they want to use it. The color scheme isn’t suited for the bush in our humble opinion, that’s why we’ve pegged this one as an in cabin favorite. It’s quick and easy to set up on your cabin bench and get cooking. The 10,500 BTU output will quickly cook your food and fill the whole cabin with delicious aromas. 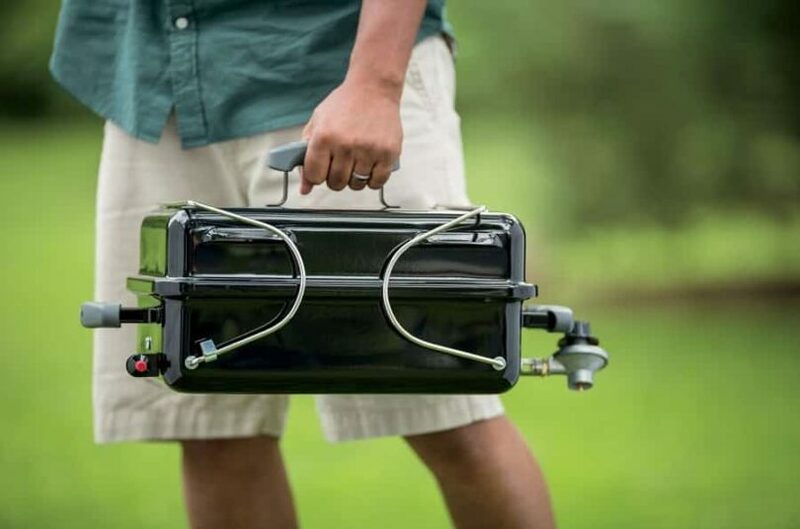 Related: Although this grill does have a handle on it already, you can amp up your gear by getting a special O-Grill 3000 Bag to carry/store the grill in. Clearly there is a range of different options in the portable grill market. They are so different that sometimes it feels like the only thing they have in common is that they run off propane! We do hope that our list above has helped to narrow down some of the better options out there for you. Personally, we think it might be worth shelling out a little extra to get the best portable propane grill you possibly can as it tends to be a once off purchase. Don’t forget to check for warranty information when buying. Despite all of the above items being very well made and reviewed, there is always the chance for hiccups. Fortunately, most sellers will give you a warranty if you ask for one. We wish you all the best with finding the perfect grill for you. Feel free to ask any extra questions you might have on portable grills in the comments below. Otherwise, enjoy those outdoor meals!